Each of the 45 individual volumes that make up the Corinth Excavation Series published by the American School of Classical Studies at Athens marks a labor of love, sweat, and tears. There are specific studies that focus on an individual building, such as the Temple of Apollo, the Odeion, or a Roman villa, unearthed through over a century of excavation and study by archaeologists. There are more general studies of a particular phase of the site, such as Scranton’s study of Medieval architecture, or general areas of the ancient site such as the volumes on the North Cemetery. Then there are systematic studies of classes of objects like pottery, lamps, and statuary. The volumes are consistently large, heavy, and neat, containing copious detail and categorization that aim to establish archaeological knowledge about a building, district, or artifact group. 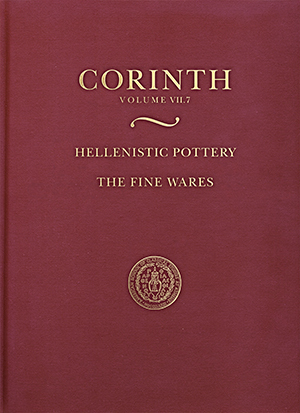 The labor to produce a Corinth volume can last a lifetime, and even those scholars who write them quickly may wait years in the production process. Using deposits recently excavated from the Panayia Field, this volume substantially revises the absolute chronology of Corinthian Hellenistic pottery as established by G. Roger Edwards in Corinth VII.3 (1975). This new research, based on quantitative analysis of over 50 deposits, demonstrates that the date range for most fine-ware shapes should be lowered by 50-100 years. Contrary to previous assumptions, it is now possible to argue that local ceramic production continued in Corinth during the interim period between the destruction of the city in 146 B.C. and when it was refounded as a Roman colony in 44 B.C. This volume includes detailed shape studies and a comprehensive catalogue. Last month, the ASCSA website posted a short interview with Sarah about the history and significance of the project that is well worth a read. You can purchase a copy for only $150 — the cost perhaps of a typical archaeological monograph — through the publisher website, or you can pay a little less via Amazon.